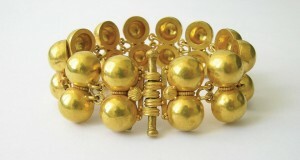 Jewelry has always been a key element in completing a perfect look. However, to find the right piece that will match your personal style is never easy. Budget, color, and how it makes you feel are just a few things to think about when it comes to choosing ideal accessories. 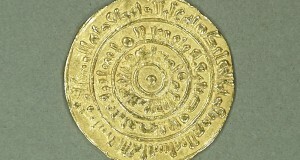 Moreover, since fine jewelry is also an investment, your decision should be informed and well-thought-out. So how to choose jewelry that will fit your lifestyle, wardrobe, and even your favorite luxury watch perfectly? Take advantage of the following ideas we have selected for you! Who said that being classic means being ordinary? With the right jewelry, you can drastically enhance any outfit! A double-strand diamond and cultured pearl necklace with matching pendant earrings is always a wonderful choice to complete an elegant look, especially if paired with a Patek Philippe 18k white gold watch. If you are looking for stylish jewelry to match your unique avant-garde style, opt for colorful bangle-bracelets decorated with sapphires, tsavorites, and other beautiful gems. Such accessories can be worn both layered and individually so that you are sure to add something new to any of your looks. 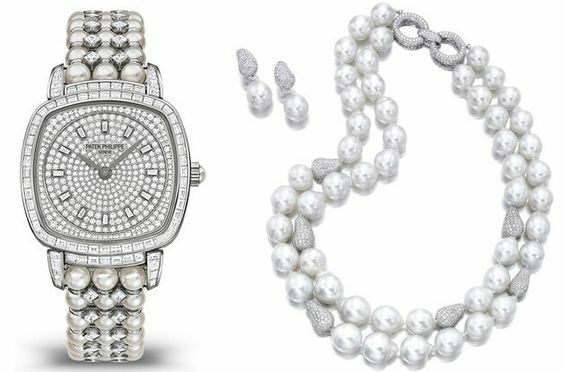 Besides, they make a perfect pair with avant-garde inspired diamond timepieces, like this F.P. 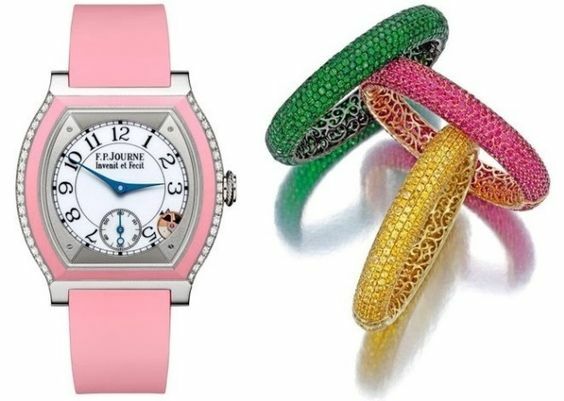 Journe Elegante luxury watch. Being a Hollywood star means to always look flawless from head-to-toe. To find the right jewelry in such a case becomes even more complicated. 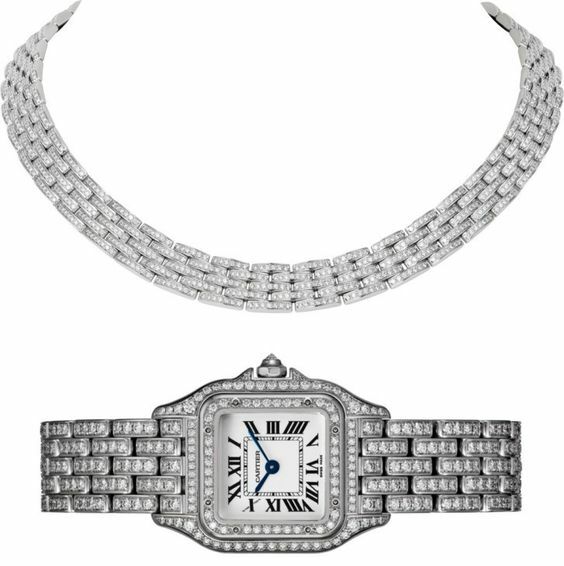 However, you will never fail if you choose something from the timeless Cartier Panthere De Cartier collection, like this pair of glamorous diamond-set 18k white gold watch and necklace. As a true trendsetter, you should always be one step ahead of fashion, presenting your own trendy ideas to others. 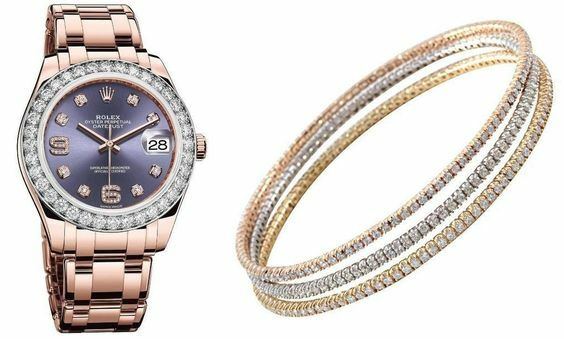 Take your inspiration from this stylish combination of the refined Rolex Pearlmaster luxury watch and a trio of 18k gold bangles decorated with diamonds! There is nothing better than abstract and textured accessories to match your inner bohemian spirit. Designs inspired by nature, precious gemstones, and unusual forms are exactly what you need for a distinctive luxury look. 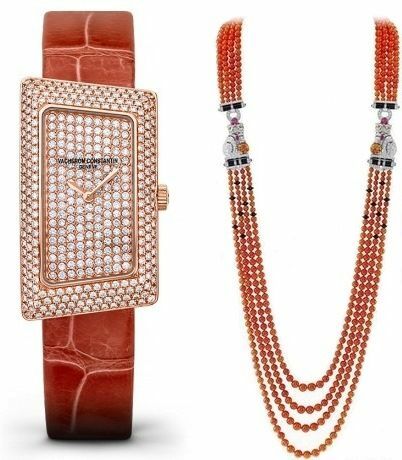 For example, this excellent duo of the asymmetric Vacheron Constantin 1972 and a Van Cleef & Arpels Palais de la Chance necklace will attract everyone’s attention for sure! Hopefully, the above list will help you find that special piece of jewelry that will perfectly fit your lifestyle, wardrobe, and your favorite luxury watch, of course!